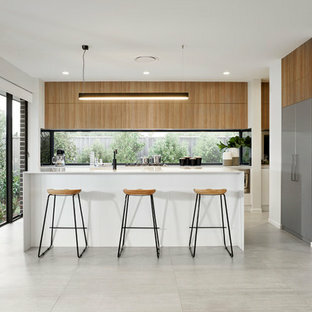 Photo of a large transitional u-shaped open plan kitchen in Adelaide with flat-panel cabinets, medium wood cabinets, solid surface benchtops, grey splashback, ceramic splashback, stainless steel appliances, slate floors, an island and multi-coloured floor. 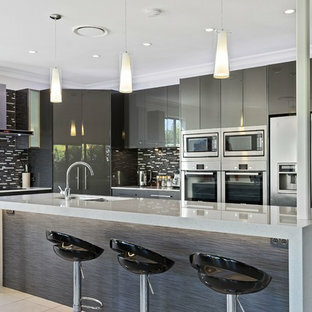 Photo of a mid-sized contemporary galley kitchen in Gold Coast - Tweed with flat-panel cabinets, grey cabinets, quartz benchtops, stainless steel appliances, ceramic floors, beige floor, an undermount sink, black splashback, matchstick tile splashback and an island. 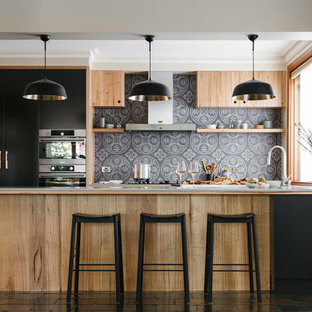 Photo of a contemporary l-shaped eat-in kitchen in Sydney with a double-bowl sink, flat-panel cabinets, medium wood cabinets, blue splashback, stainless steel appliances, medium hardwood floors, an island and brown floor. 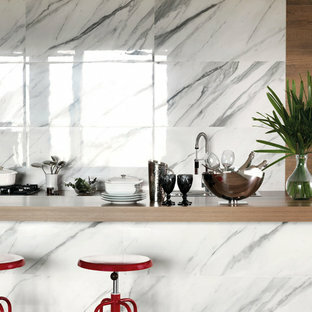 This kitchen was designed by Mikal Otten. Interior design by Beth Armijo (www.armijodesigngroup.com). Photography by Emily Minton Redfield. Photo of a transitional kitchen in Denver with stainless steel appliances, recessed-panel cabinets, white cabinets, blue splashback and quartz benchtops. 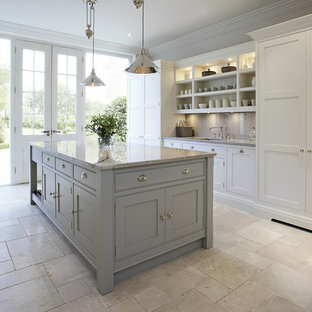 Inspiration for a transitional kitchen in Atlanta. This is an example of a transitional kitchen in Houston with an undermount sink, recessed-panel cabinets, grey cabinets, white splashback, subway tile splashback, stainless steel appliances, light hardwood floors, an island and white benchtop. 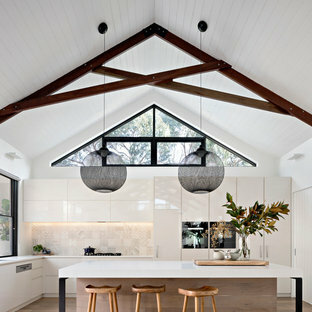 Expansive contemporary open plan kitchen in Sydney with flat-panel cabinets, white cabinets, marble benchtops, an island, white splashback and panelled appliances. 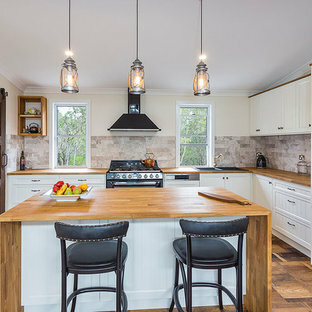 Photo of a traditional kitchen in Chicago with glass-front cabinets, stainless steel appliances, a farmhouse sink, white cabinets, marble benchtops, white splashback, subway tile splashback and white benchtop.